Supermend is the original fabric/textile bonding powder and invisible mending repair kit – as seen on TV in many countries. Supermend can be used to repair and secure torn, ripped, burns or cover holes in most fabrics, whether its clothing, upholstery or furniture! It can even be used to repair fabrics you cannot turn inside out, such as your sofa or car seat, to give you a repair that is invisible to the eye. Supermend is also fantastic for hemming any fabric, no matter how fine it is; from a wedding dress or denim trousers, to silk curtains or woolly skirts. As it is non-porous, the powder will seal the fabric without transference to the other side, and without the need for visible stitch marks. But that’s not all, Supermend’s fabric repair kit can also be used to make labels, name tags and badges; repair pockets, appliqué work. It is even suitable for knitting, bonding loose floats and inserting zips, and you can even make an entire quilt without ever touching your sewing machine! To find out just how versatile Supermend is, have a look at our Selection of Repairs page. Simply place your rips back together, or fill any holes with a piece of the same fabric taken from a concealed part of the garment, such as a pocket, shoulder pad etc. Sprinkle the powder over the area and blow away any excess. Cover with a sheet of grease-proof paper or thin cloth, apply heat with an iron and you’re done. All effective repairs will stand up to washing, boiling and dry-cleaning over and over again. We believe that our product is the most versatile repair product in the Sewing and Crafts industry! We are even recommended by top tutors from Arts and Textile colleges, worldwide. 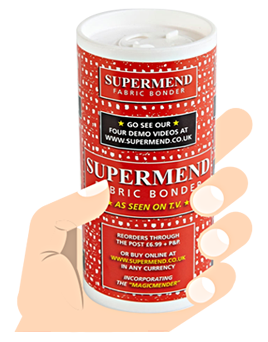 Having been established for over 20 years, Supermend Limited are the sole manufacturers of this unique product. We are able to supply Supermend to anyone, on an individual or trade basis, worldwide. Non-toxic and BSI approved, Supermend is suitable for pets or animals, babies and repairing children’s toys. Customers tell us that Supermend is the most versatile product in the Arts and Crafts Industry! We have been supplying professional companies and Arts and Textile colleges worldwide for many years. Visit our Testimonials page or Facebook page for reviews.